Everyone deserves a lush lawn that makes outdoor living comfortable… And that’s what we’re trying to achieve. A better lawn — for less. 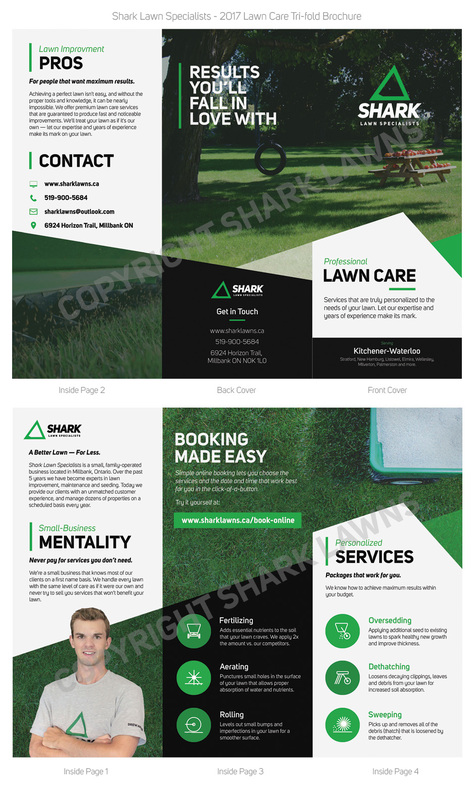 Shark Lawn Specialists is a small, family business located in Millbank, Ontario. We have been officially operational for the past 5 years, during that time we have become experts in lawn seeding, improvement and maintenance. Today we serve customers throughout southern Ontario, working alongside a number of contractors and managing dozens of properties on a scheduled basis. Specializing in new lawn development, we prepare, seed, and maintain newly developed areas to create thick and healthy lawns. Over the years we have become known for our thorough processes, detail oriented work and cost related value – as a result, Shark Lawns has become the go-to for lawn seeding locally, and provincially. Working alongside our partnered contractors and on an individual basis, we create a number of new lawns and satisfied customers each year. In addition to our development seeding, we also handle seasonal and routine lawn care providing results that are second-to-none. Our seasonal services include fertilizing, overseeding, aerating, rolling and sweeping. At Shark Lawns, we realize that every lawn is different... Using our knowledge and experience, we provide your lawn with personalised care that fulfils its individual needs and turns ordinary yards into healthy, green masterpieces. Over the past few years, we have doubled in size from one year to the next. Each season we take on countless new projects and ongoing clients and provide them with honest, neighbourly service that makes customers love us. We'd love to hear from you to discuss your needs, review your project or get down to business. Remember, with Shark Lawn Specialists, you'll get a better lawn — for less. Lawns are our thing – we take pride in transforming yards into comfortable, outdoor living spaces. We're happy to chat with you, and give you all the secrets to obtaining your dream lawn. Over the years, we've gotten pretty good at what we do. We've realised that every lawn is different, and have devised the know-how to transform lawns stuck in any situation. Our customers are our only priority. We want each our customers to see the same results we see on our own lawns; and that's why nearly every customer that switches to us, stays with us. Building, renovating or improving can be a stressful ordeal and when all is said and done you're left with a sloppy, excavated mess. We specialise in transforming that mess into a beautiful green lawn, and handle everything while you put your feet up and relax. Our goal is to ensure having your own beautiful lawn is as simple as 1,2,3 – and now it is. 1: Book services or an appointment online, by email or by call. 2: Let our expertise treat your lawn as if it was our own. 3: Watch as your lawn improves and repeat annually for maximised results. We create premium lawns at affordable prices. After switching to us from our competitors, our customers see improved results and put money back in their wallet, and that's why almost all of our customers are repeat customers. We are a small business with a small business mentality and are happy to offer our expertise and help you in any way possible. We handle every project, large or small, in a timely manner with professionalism and a smile on our face. We appreciate the contractors that work alongside us by giving back. In fact, for every project a contractor passes on to us, they receive a 7% - 10% commission. Learn more about this incentive on our Business Solutions page. Looking for quality and affordable lawn seeding or turf improvements? Shark Lawn Specialists is a small, family business located in Millbank, Ontario. We have been officially operational for the past 5 years, during that time we have become experts in lawn seeding, lawn care and improvements. Today we serve customers throughout southern Ontario, working alongside a number of contractors and managing dozens of properties on a scheduled basis. Sign up for our newsletter and recieve coupons, updates and reminders to ensure your lawn stays as healthy as ever. NOTICE: We have begun working this business part time to explore other business avenues. Still feel free to call Bill and chat about your project, but we can't guarantee we'll have time for every project. Thanks for understanding. Some garments are just too dear to us to part with. What Is Identity and Why Is It Important for Expats?